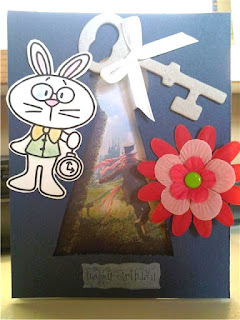 Anyways, I always think of a key when I think of Alice in wonderland, maybe because she had such a hard time figuring out that all she needed was a key to get out of that tiny room... who knows... but this card is set up on that premise. The dark blue paper is up on pop dots to add that dimension to the mad hatter running away from us... the white rabbit is reminding us that we're late... so inside the card it says "I'm late, I'm late, I'm late, Happy Belated Birthday!" That's it for now... it's off to the gym! Very creative. Thanks for playing at 365 Cards.